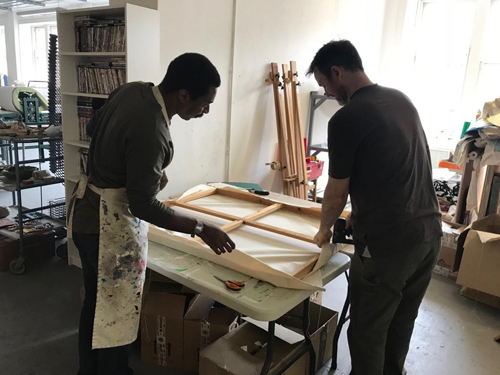 Earlier this month, London-based artist Thompson Hall visited Project Ability with his ActionSpace Artist Facilitator Lisa Brown for a three day residency in our studios. Here is what he had to say about his experience. 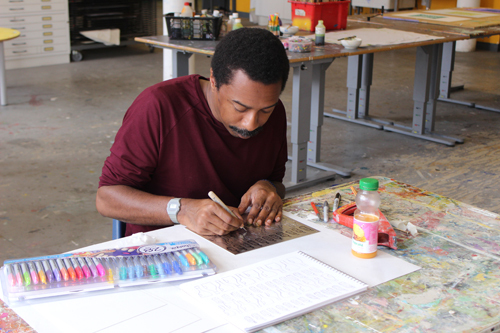 “I would like to thank Project Ability for inviting me to spend time in their studio for a residency. 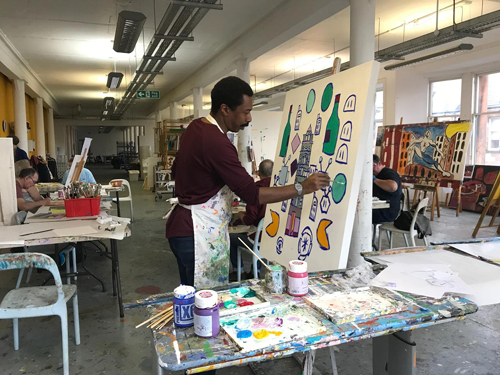 Doing a short residency was one of the things I identified as the next step after the exhibition I created with my studio colleague Ian Wornast, My Life in London, which was shown at two venues in London earlier this year. 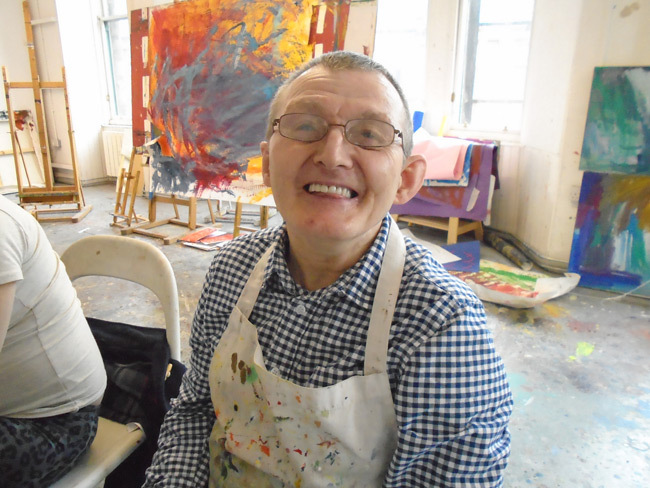 I feel that being around the other artists that I met at Project Ability was very inspiring because it enabled me to find out about their work and at the same time learn some new skills, such as making my own canvases and producing lots of prints from the drawings I did in my sketchbook on the train. 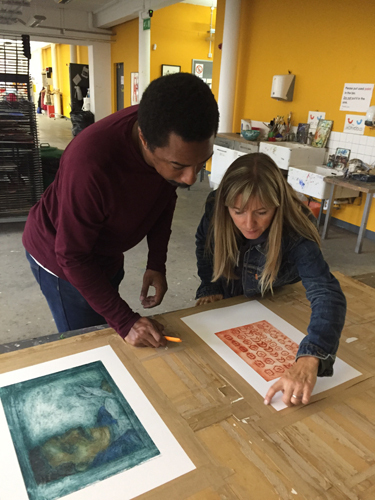 I also found working alongside Lisa Brown, my ActionSpace Artist Facilitator, who was making some work as well, was very useful and has inspired me to make more work and given me ideas for doing more things in the future. I felt I enjoyed the whole experience in spending time just experimenting with different materials and not being under pressure to produce work for an exhibition. I also felt more relaxed around the people I met. I wish I could have spent more time with them to talk about my work and ask them questions about their work. I’m looking forward to visiting Project Ability again at the beginning of next year, when my exhibition will be in the gallery. I hope I will get to have more time getting to know your artists a lot more. 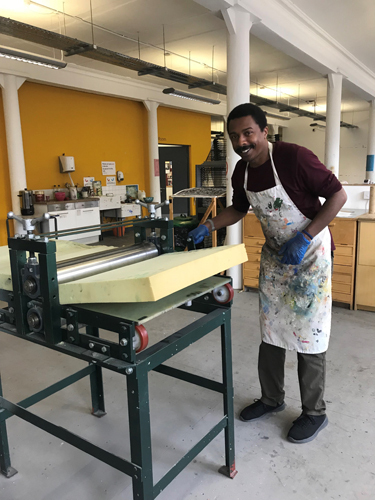 Thompson Hall is at Studio Artist at Action Space, a London based arts organisation that supports artists with Learning Disabilities. Images from My Life in London and more of Thompson’s work can been seen here.